During a time when so many are wondering how to talk to their children about the school massacre in Newtown, Conn., some familiar voices of reassurance have surfaced online. Among them is Fred Rogers, even though the children's television icon passed away in 2003. Fred Rogers meets children at a school in Pittsburgh in a photograph taken by Jim Judkis. "Mister Rogers Neighborhood" went off the air in 2001, but the TV host's calm approach and knack for relating to kids is being called upon now. In a message that's gone viral on Facebook, and originated on PBS' "Helping Children Deal with Tragic Events" web page, Rogers talks about what his mother taught him when it came to scary situations. "When I was a boy and I would see scary things in the news, my mother would say to me, 'Look for the helpers. You will always find people who are helping," Rogers said. "To this day, especially in times of 'disaster,' I remember my mother's words, and I am always comforted by realizing that there are still so many helpers -- so many caring people in this world." 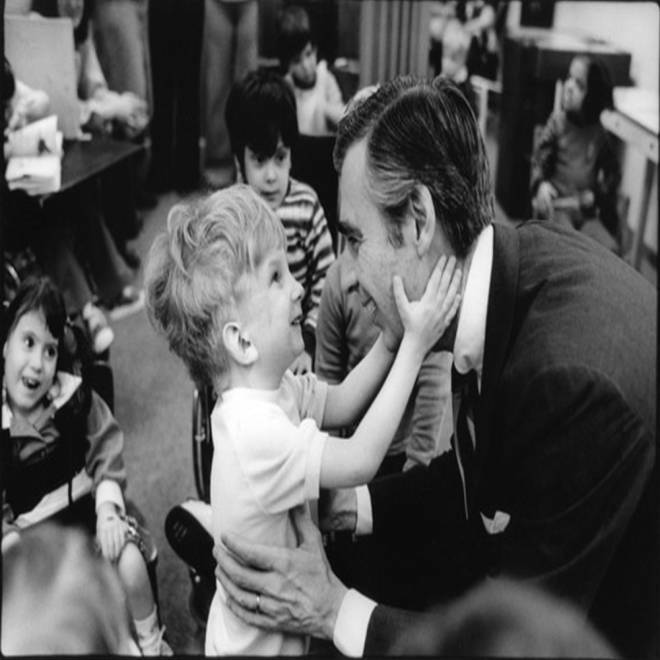 On the Facebook page 170 Million Americans for Public Broadcasting, the words were attached to a photo showing Rogers interacting with a young child. More than 48,000 people "liked" the image and 88,000 had shared it by Monday afternoon. On the Washington Post website, Maura Judkis wrote about the photograph, which was taken by her father Jim Judkis during a shoot for People magazine. The photographer is sure that if Rogers were alive today, he'd be doing anything he could to help the children of Newtown. LeVar Burton, who hosted "Reading Rainbow" on PBS from 1983-2005, shared his own thoughts on the Reading Rainbow blog. "I offer prayers for the families and the community devastated by this violence against the innocent. This year has seen several tragic shootings which are terrifying for all of us. When this happens in an elementary school, a place of safety, of learning, of play, our suffering is amplified. It would be best of course if children never have to hear about events like these, however that is not the world we seem to live in!" "Sesame Street," another childhood mainstay, is not going to air a special episode aimed at addressing the events in Connecticut, but has posted resources online to help parents talk about what their kids might be seeing or hearing.